Heat oven to 350°. Spray three 10-oz custard cups with cooking spray. Stir coffee and liqueur in small bowl until coffee is dissolved. In small bowl, beat coffee mixture, cream cheese, baking mix, sugar, vanilla, egg and chocolate with electric mixer on high speed 1 minute. Spoon into custard cups. Place custard cups on ungreased cookie sheet about 20 minutes or until center is firm and puffed. 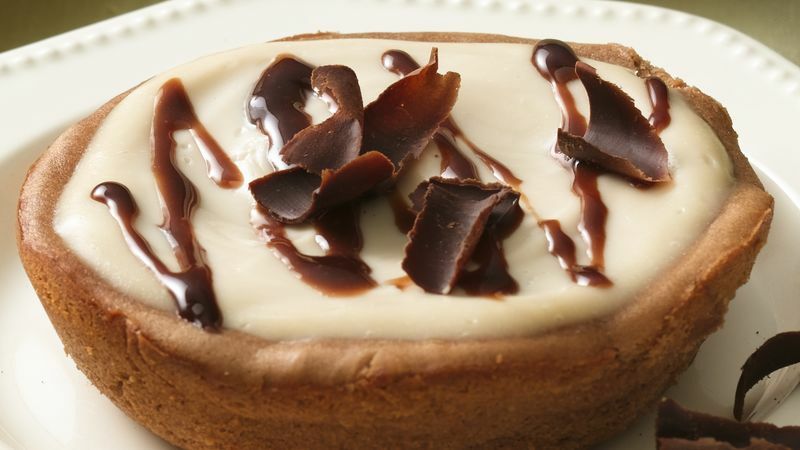 Cool 5 minutes (top of cheesecake may be cracked). In small bowl, stir powdered sugar, liqueur, sour cream and vanilla, until blended. Carefully spread over cheesecakes. Cool 30 min. Refrigerate at least 2 hours until chilled. Sprinkle with chocolate shavings before serving. Store covered in refrigerator.